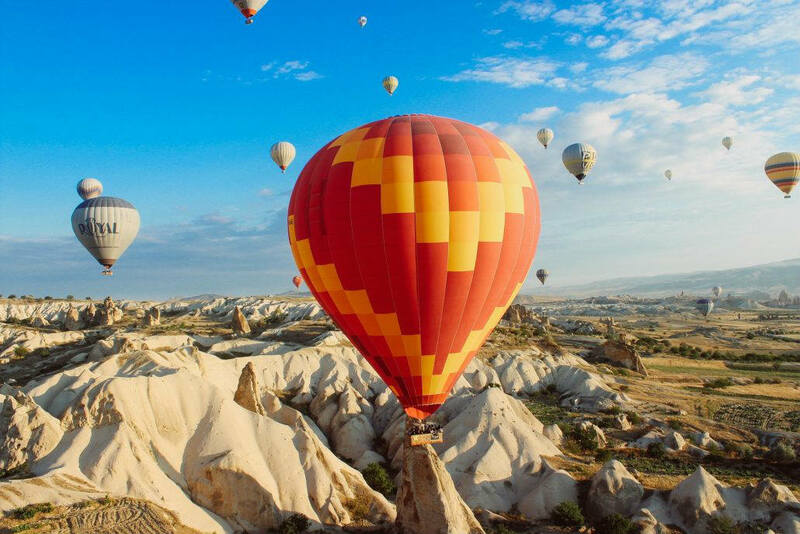 Is this your first time going out on a hot air balloon ride? Or just need some more information to help you experience one of the most adventurous things you’ve ever done in your life! We’ll give you info on what to expect. Sneakers with high socks or high boots(so you can protect your feet from grass burns of the field we will normally land in). All you really need to bring to enjoy the experience of hot air ballooning is yourself. Although these items do come in handy. Begin your adventure in the air! Once you meet your crew and pilot you will head out to the launch site. Be sure to meet on time so that the launch is not delayed and you don’t ruin it all for everybody else and you can get your full flight time experience. There are no bathrooms 5,000 feet in the sky so make sure you use the restroom before getting into the balloon. Booking a shared flight means you will share a ride with other passengers which in most cases have made friendships this way. Private flights, on the other hand, well just be whoever is with you and the pilot and crew. The balloon will be laid in such a way that the wind will help to inflate the balloon. When the balloon is ready to inflate, an inflation fan will force air into the balloon. This requires two people to help hold the balloon open and would make a great photo opportunity. Anyone holding cables must listen to the pilot to ensure everybody is safe. Once the air has filled up the balloon the pilot will light the burner to bring the balloon upright. After that, we can now climb into the balloon gondola which is the basket you would sit in to enjoy the ride. Most riders don’t realize how calm and beautiful a hot air balloon experience can be. Since we are one with the wind, floating through the air at different altitudes, the only time you even feel the air is when the balloon changes altitudes or the natural wind speed changes. Landing is actually the most exciting part of riding a hot air balloon. Our experienced pilot will look for a landing site based on the geography of the land and the time of day. How good of a landing we get depends on the wind speed and terrain. Calm winds mean there is a chance for the hot air balloon to rest on the ground with little to no impact. Which is called a “stand up landing”. Moderate winds are where the fun is and your pilot may tell you to crouch down. He’ll then instruct you to turn sideways from the ground and ask you to bend your knees slightly to help absorb the impact. The balloon may be pulled and turned sideways with moderate and any wind speed faster. The gondola can help you brace and keep from any injuries from happening. When the balloon has come to a stop if it is upright the pilot will tell passengers to wait until some of the hot air is released. Letting hot air releases from the balloon ensures the balloon doesn’t take off again when you try to get off. For all the cool people that landed sideways, the balloon will be deflated hastily and you will be able to climb out of the basket.